I am currently reading "Twelve Extraordinary Women" by John MacArthur in preparation for leading the Crossroads Young Single Ladies group tomorrow. 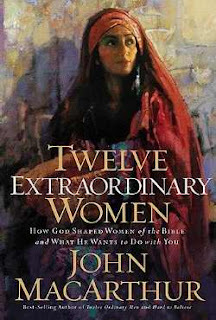 In the intro MacArthur says , "All these women ultimately became extraordinary not because of any natural qualities of their own, but because the one true God whom they worshiped is great, mighty, glorious, and awesome, and HE refined them like silver. He redeemed them through the work of an extraordinary Savior - His own divine Son..."
This is a message of hope. We don't have to be wealthy, well known, attend the top schools, or considered important - we just have to be available to become the people God needs, and the people God can change and use for eternity! We only become extraordinary through the power of the Holy Spirit as we allow God to invade every ordinary part of our being. Can you imagine what it must have been like to just be an ordinary person and suddenly you become one of the people He chooses to use in the Bible to teach millions and millions of people about His plan for their life? These women never knew their story was chosen to be part of the Bible - they were just available and faithful just as we should be.